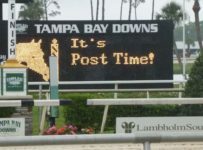 Bob Bauer is HorseRacingFLA Tampa Bay correspondent and handicapper. 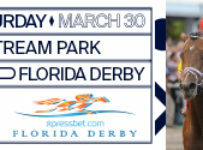 He is a former thoroughbred racing reporter for the St. Petersburg Times and a former publicity director for Tampa Bay Downs. Wide-open may be the best description of this year’s renewal of the Belmont Stakes. 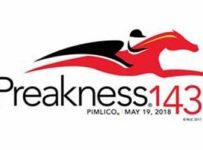 The third jewel of the Triple Crown is known as the test of champions because of the grueling twelve-furlong distance that these sophomores will attempt, most for the only time in their career. Add in the fact that there is but one Grade I winner running and he may not be at his best right now. 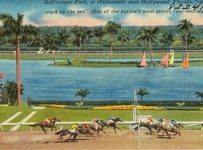 That horse is Gormley, who won the Santa Anita Derby, and later finished ninth in the Kentucky Derby. 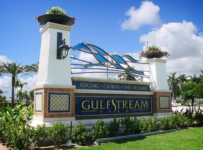 Then, we have 5 others in this dozen-horse field who have taken lesser Graded Stakes and have displayed varying degrees of talent and distance ability. They are Irish War Cry, Tapwrit, Senior Investment, J Boys Echo and Multiplier. Listed below in order of preference are a quartet of three-year-olds who appear to have the goods to get it done this Saturday. Numbers in front of names are post positions. 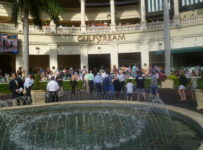 Morning line-odds are in parentheses. 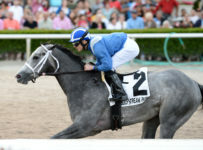 2 – TAPWRIT (6-1) First, give this grey son of Tapit a pass for his last pair of starts. 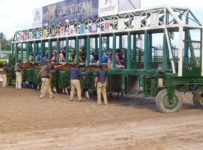 In the Kentucky Derby he was one of several runners who endured a rough trip over the Churchill Downs quagmire. Prior to that, he was unprepared for the break but improved in Keenelandâ€™s Blue Grass Stakes. 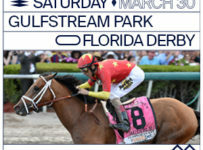 Three races back, his sharp four-length score in the Grade II Tampa Bay Derby shows what this one is capable of, and a repeat of that effort could land him in the Belmont winner’s circle. 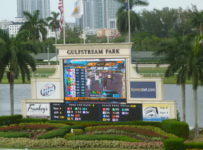 He showed a liking for the Tampa Bay track (1 win, 1 place) that is known to be a deep and demanding surface, perhaps similar to the big sandy. He is a closer, but more importantly he can get position mid-pack and stalk what should be a contested early pace. 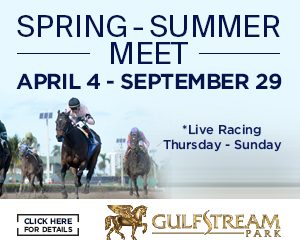 World-class conditioner Todd Pletcher has put him through a trio of good drills at Belmont and regular rider Jose Ortiz has the return call and can work a Tampa-like trip. A lot to like here. 7- IRISH WAR CRY (7-2) The morning line favorite boasts a lifetime 4 for 6 record and is another who should be forgiven for (a tenth place finish) the Kentucky Derby. Some ask the question, which Irish War Cry will show up this time? 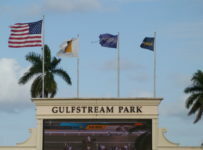 The good Irish War Cry captured Gulfstream’s Holy Bull and Aqueduct’s Wood Memorial (Grade II events) by more than 3 lengths each. When less than good, he lost by double digit margins. This year his form shows a nice win followed by an ugly loss and then the same pattern repeats itself. Able trainer Graham Motion has worked him twice at Fair Hill and he may bounce back from his Derby defeat here. The son of Curlin is bred for the distance and could be leading down the backstretch after the early leaders sort themselves out. 4 – J BOYS ECHO (15-1) His last couple of races are also throw-outs. He was a victim of bad starts in the Kentucky Derby and Blue Grass Stakes. 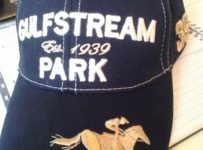 Three races ago, he earned one of the top speed figures here winning the Grade III Gotham Stakes over Aqueduct’s Inner Dirt track and may be this good. The Aqueduct efforts also show potent late pace ability, always important at this distance. Veteran jockey Robby Alberado, who has guided this offspring of Mineshaft to both lifetime wins, is back in the irons after recovering from injuries. Wouldn’t be surprised to see him coming late at a big price. 10 – MULTIPLIER (15-1) Earned an outstanding speed figure taking the Grade III Illinois Derby in his first stakes try after a Maiden victory. 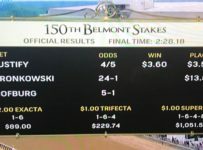 Next, he had some trouble and was steadied in the Preakness, his only time finishing off the board. Gets blinkers on for trainer Brendan Walsh who is handy with marathon runners. Recommend using in exacta and trifecta boxes.